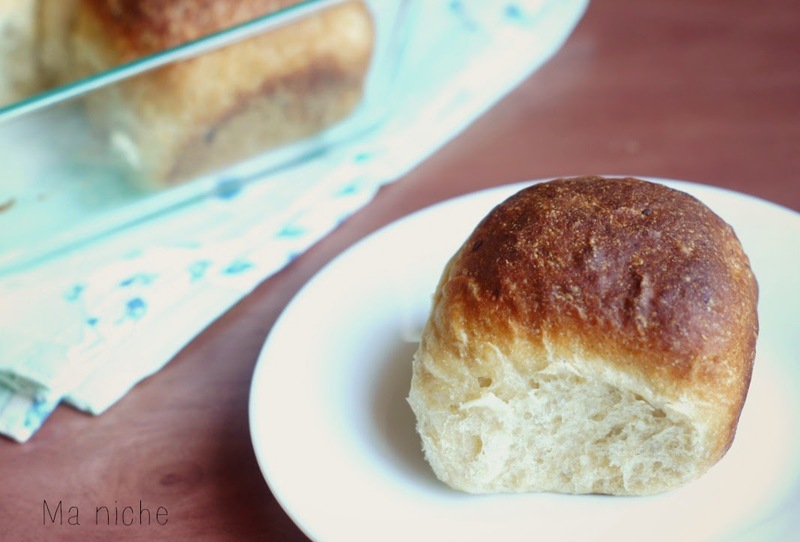 Around St Patrick's day, when I was looking for something Irish to make, I came across the Whole Wheat Potato Bread in Beth Hensperger's Bread lover's bread machine cookbook. Apparently in the late eighteenth century, potatoes or spuds as they called them, became a staple in the Irish diet. One-third of the population then, solely relied on this cheap crop. Lack of genetic diversity, left the crop vulnerable to diseases and in 1845, the rapid spread of a plant disease called late blight resulted in the crops failure in the poorer communities of western Ireland. That led to the Great Irish Famine, also known as the Irish Potato Famine, in which approximately one million people died and a million more emigrated from Ireland. The Irish immigrants apparently brought the tubers to New England, a region were potatoes are grown even today. One. The book recommended using the whole wheat cycle, which has a shorter mixing and kneading time and yields a loaf. I did not want a loaf, I wanted dinner rolls. So no thanks. I rather knead by hand. And as you can see the plan worked beautifully ! Put all the ingredients in a big bowl and using your hands knead till you have a soft dough. I always find it easier to oil my hands well while kneading. Also the oil from the hand helps in kneading a soft smooth dough. Once you have a smooth dough, place it in a well greased container, cover the container with a plastic cling wrap or kitchen towel and keep it in a warm corner of the kitchen. Let the dough rest and double its volume. This might take about 1½ hours or more. Keep a close watch. Once it has double, turn it out on a lightly floured surface, punch it and deflate it. Then divide into 12 equal balls. Shape the balls into round discs by pinching in the edges together and flattening them a bit. 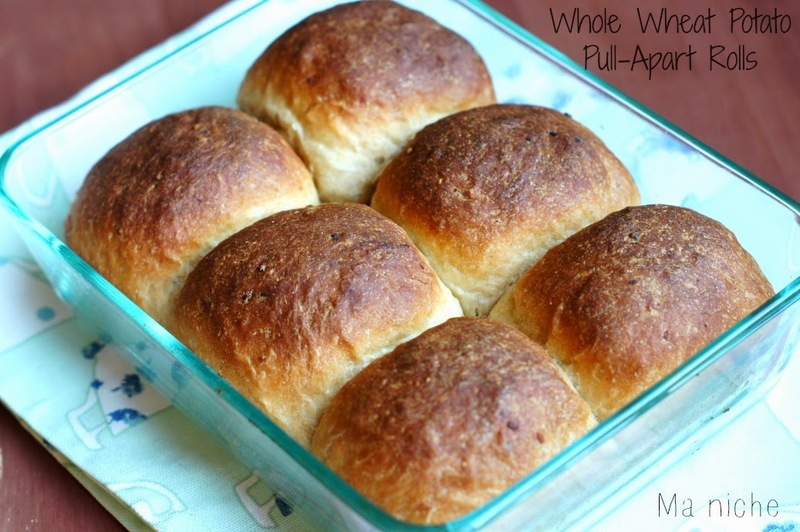 You can either make 12 whole wheat dinner rolls(as I had initially decided to do) or make a batch of 6 pull-apart rolls with half of the dough and make sweet breakfast muffins buns with the remaining half (as I finally ended up doing). 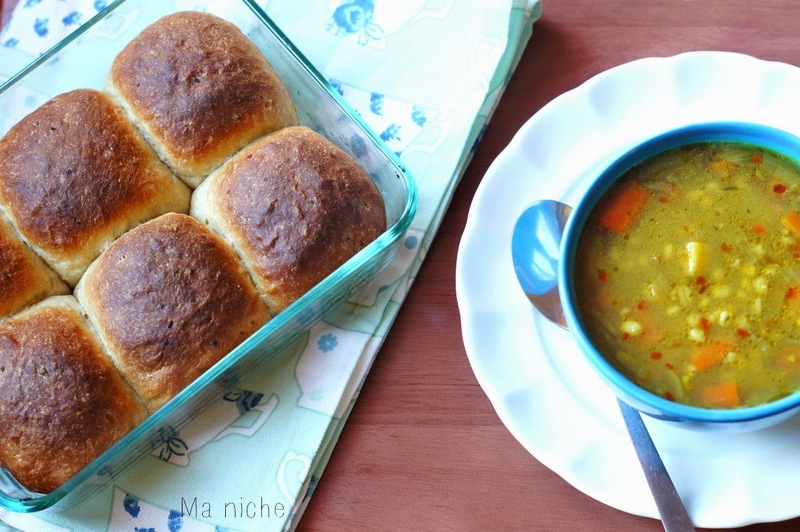 In case you decide to make dinner rolls alone, grease two 6-cup rectangular pyrex containers or a couple of baking dishes of equal capacity and place 6 balls of dough in each. Cover the containers with a plastic cling wrap or a kitchen towel and keep them in a warm corner of the kitchen. Let the dough double. This will probably take 45 minutes to an hour. Meanwhile center the rack and preheat oven to 375 °F. Once the dough has doubled bake them for 45-50 minutes, until they have turned golden brown. Cool completely before pulling them apart and serving. 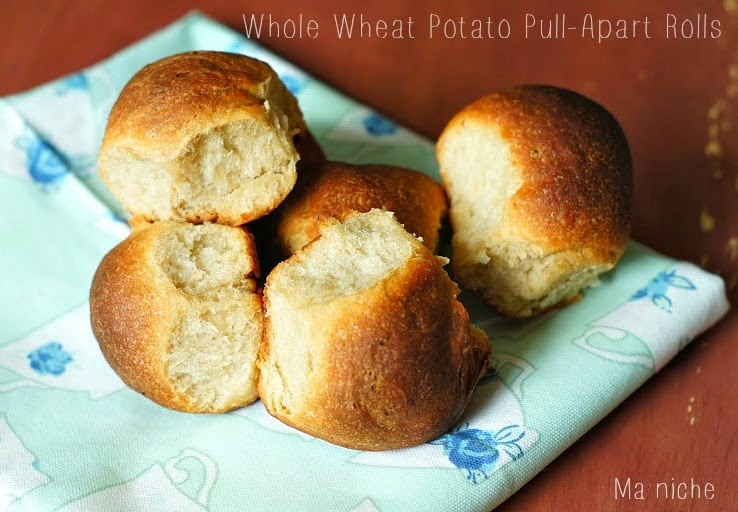 Your Irish Whole Wheat Potato Pull Apart Bread looks amazing, I can almost taste it. Thank you so much for sharing with Food of The World this month and hope you are having a great weekend!